Hello there and thank you for your interest in Reeds Weybridge RFC. Reeds Weybridge RFC is an inclusive, community rugby club focused developing our players as people and rugby players through our mutual passion for the game. We feel this is best done through excellence in coaching and promoting Rugby’s core values of Teamwork, Respect, Enjoyment, Discipline and Sportsmanship with an emphasis on enjoyment! All sessions are designed to put smiles on faces whilst building the player’s ABCs (Agility, Balance, Coordination and Speed). 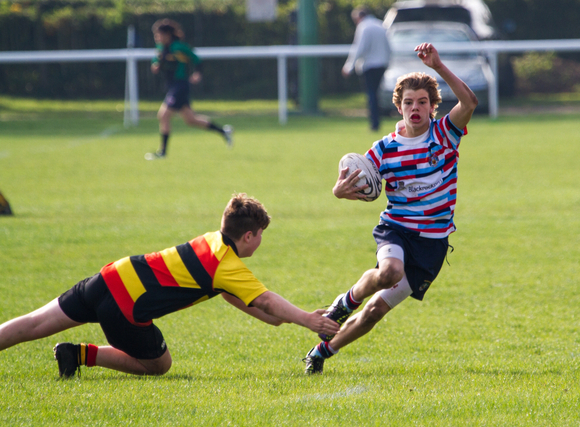 We follow the RFUs new rules of play for the player’s progressive development within the game. U7-11s have the opportunity to place in festivals and fixtures against other local clubs, starting with small side games (4 a-side at U7 progressing to 9 a-side at U11s) and last year 200 parents and players from the minis section enjoyed a successful tour to Camber Sands playing clubs from far and wide. We don’t operate a cap on numbers and cater for children of all abilities and experience, so all are very welcome and there’s no need to have played before. The season starts on the first Sunday in September and runs nearly every Sunday (except Christmas and Easter) until the end of April. All minis (U5-11) meet at the club around 9.15am for registration with play starting at 9.30am. U7-11s sessions last around 90 mins. The registration desk for U5-6s is located near the clubhouse entrance and all other age groups should report to their coaches at their allocated pitches. On your first day, there’s no need to pre-register, just come along and ask at the registration desk for your age group pitch. The clubhouse is open during training, selling hot drinks and bacon rolls (very important) and the sweet shop opens up at the end of training which is (as you can imagine) often a highlight! There is also a kit shop open on site every week selling Reeds kit plus other rugby basics such as base layers. All potential new players can come to Reeds and enjoy a complimentary session on us. There is a “Pay & Play” option of £5 per week for the U5-6s, however those that decide to take out an annual membership receive a complimentary Reeds shirt. Please note only full members can take part in Festivals. If there is anything else you would like to know please just get in touch and we very much hope to see you soon.